NCAA indoor runner-up (pentathlon), NCAA Outdoor bronze medalist (heptathlon), Three-time All-American, SEC outdoor champion … Opened her junior season with a long jump win at the Arkansas Invitational … Picked up two more event titles in the long jump and 60-meter hurdles to cap the the regular season at the Arkansas Qualifier … Helped the Razorbacks capture another conference title as the SEC runner-up in the pentathlon with a score of 4,450 points, while also scoring in the long jump … Qualified for the NCAA Indoor Championships in the pentathlon and the long jump … Set a program records in the pentathlon (4,580 points) and the long jump (21-3.50), placing her second and ninth, respectively, in those two events at the national meet … Kicked off her combined events outdoor debut at the Texas Relays, finishing second with a PR of 6,075 points to take the NCAA lead … Lead leg for the 4-x-100-meter relay team that set a program record of 43.57 at the SEC Relays … Captured the SEC title in the heptathlon with a program record score of 6,099 points … Qualified for the NCAA Outdoor Championships in the heptathlon … Closed out her year winning a bronze medal in the heptathlon, assisted by a program-record performance of 21-4 in the long jump. 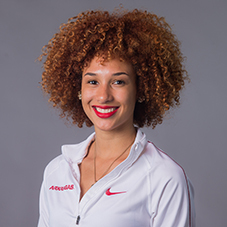 NCAA indoor runner-up (pentathlon), NCAA Outdoor bronze medalist (long jump), Three-time All-American … Collected several personal best marks at the Razorback Invitational in 800m (2:19.06), 60mH (8.18) and the long jump (6.35m/20-10) to pace her to a pentathlon PR of 4,457 — second best performance in program history … Captured second-team All-SEC honors with a runner-up finish in the pentathlon … Qualified for NCAA Indoor Championships in three events (60mH, long jump, pentathlon) … Scored eight points towards the Razorbacks’ national runner-up finish placing second in the pentathlon with a score of 4,432 points … Capped her second indoor season with three All-America honors … Kicked off the outdoor season as the 2016 Clyde Littlefield Texas Relays champion with a score and personal best of 5,991 points … Set a new school record in the long jump at the Arkansas Twilight (5/6) of 6.39m/20-11.75 … Scored five points at SEC Championship with a fourth-place finish in the heptathlon to help Arkansas to another Triple Crown … Qualified for the NCAA Championship as one of the top-three best long jumpers out of the NCAA West Preliminary round as one of the top-five best heptathletes in the nation … Picked up six points for the Razorbacks with a solid effort in the long jump at the national meet to help clinch Arkansas’ first NCAA Outdoor title … She closed her season as the 2016 NACAC heptathlon champion for team USA. Indoor First Team All-American … Outdoor Second Team All-American … Earned SEC All-Freshman team honors for her seventh-place finish in the pentathlon … Qualified for the NCAA Indoor Championships … Posted a new PR in the high jump of 1.80m/5-10.75 en route to finishing seventh at the indoor national meet in the pentathlon with a career-best 4230 points … Opened up the outdoor season with a fourth-place finish at the Clyde Littlefield Texas Relays helped along by a runner-up finish in the heptathlon 100-meter hurdles … Finished in fifth place in the open 100-meter hurdles at Drake Relays … Collected two points for the Razorbacks in the heptathlon at the SEC Outdoor Championships finishing in the top five in four multi-events (100H, 200m, high jump, long jump) … Qualified for the NCAA Outdoor Championships in the 100-meter hurdles and heptathlon … Finished in the top five in two multi-events posting a PR in the long jump with 6.28m/20-7.25 … Earned Honorable Mention honors for the 100-meter hurdles … 100-meter hurdle participant at the USA Outdoor Championships. Redshirted during her first year … SEC First-Year Academic Honor Roll. Regional finalist in hurdles, high jump, and long jump…Texas Relays long jump champion…State qualifier and medalist in the 100-meter hurdles as a junior…Broke the school record for the 100m hurdles, 300m hurdles, high jump, long jump and 4x400m relay…Lettered in track and basketball all four years…Named Academic All-District for four consecutive years…Earned Texas Scholar honors…Member of the National Honor Society. Born Feb. 8, 1995 … Daughter of Robert Brooks and Diann Clark … Has three sisters and one brother … Majoring in communications with a minor in legal studies.